This PySpark notebook introduces Spark GraphFrames. Abstract from Stanford’s website: This dataset consists of ‘circles’ (or ‘friends lists’) from Facebook. Facebook data was collected from survey participants using a Facebook app. 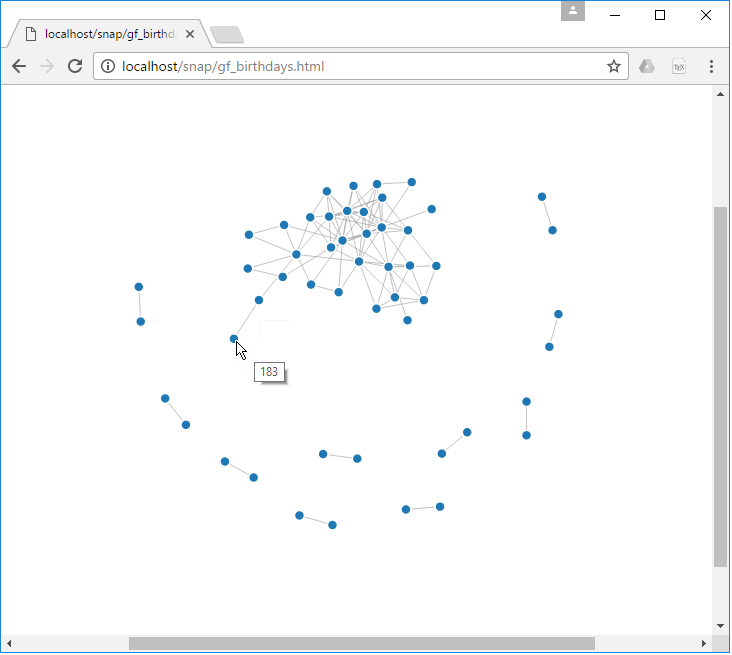 The dataset includes node features (profiles), circles, and ego networks. Facebook data has been anonymized by replacing the Facebook-internal ids for each user with a new value. Also, while feature vectors from this dataset have been provided, the interpretation of those features has been obscured. For instance, where the original dataset may have contained a feature “political=Democratic Party”, the new data would simply contain “political=anonymized feature 1”. Thus, using the anonymized data it is possible to determine whether two users have the same political affiliations, but not what their individual political affiliations represent. For this article, the data files has been downloaded, cleaned from duplicate data and properly formatted in csv format for better handling. You can download the vertices file from here and the edges from here. All files, including this article as a Python notebook and draft D3js html code can be downloaded from here. Thanks! Let’s start our introduction to GraphFrames. The following assumes that you have a PySpark interactive console available. It is the building block of spark. All data abstractions, such as DataFrames and GraphFrames, are interprested (transformed) in RDDs. RDD is lazily evaluated immutable parallel collection of objects normally exposed with lambda functions. RDDs are simple to use and expose an Object Oriented like API. See Spark Programming Guide. Its main disadvantage is performance limitations. Being in-memory JVM objects, RDDs involve overhead of Garbage Collection and Java Serialisation which become expensive when data grows. A DataFrame is a Dataset organized into named columns. It is conceptually equivalent to a table in a relational database or a data frame in R/Python. See (Spark SQL, DataFrames and Datasets Guide)[http://spark.apache.org/docs/latest/sql-programming-guide.html]. # We will do the same for edges. GraphFrames is a package for Apache Spark which provides DataFrame-based Graphs. It provides high-level APIs in Scala, Java, and Python. It aims to provide both the functionality of GraphX and extended functionality taking advantage of Spark DataFrames. This extended functionality includes motif finding, DataFrame-based serialization, and highly expressive graph queries. Clounce hopes that you took some good points from the above. Until the next blog entry, take care and be kind to humanity!